Mr. Daniel Botwe, former Minister of Information at the weekend in Tamale indicated that he was out fully to contest the New Patriotic Party's (NPP) flag bearership race for the 2008 elections.He has therefore called on all party delegates and sympathizers to lend him the needed support to win the primaries to lead the party to victory in 2008 to dispense good governance to Ghanaians. Mr. Botwe appealed to delegates and all those who support him to rule the country not to listen to any propaganda that sought to create the impression that he was only "testing the waters" and to later support one of the candidates already in the race.Mr. Daniel Botwe said these when he briefed the media in Tamale on Saturday to throw more light on his activities towards the race for the flag bearer of the NPP and how he could win the primaries for the big post of the party and to formally confirm his intention to the delegates in the region. "The limited objective is to confirm to delegates that I am not stepping out of the contest. I will give Ghanaians my time measured plans aimed at developing the country if I win the race in December this year." he said.He said, no one goes to war in anticipation of being killed or losing the battle and that adequate measures were put in place to ensure that he wins the primaries convincingly to ensure that the NPP won the 2008 elections with ease. Mr. Botwe said, he had been the party's General Secretary and Organizer before and he knew how to galvanize support for votes, which he succeeded in helping to win the 2000 and the 2004 elections. He said the 2008 elections was going to be the toughest ever and would be keenly contested and needed someone who had been with the people throughout difficult times to be able to retain power for the NPP, adding that he was a threat to candidates in any of the opposition parties. 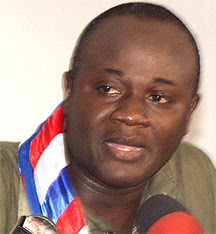 On the number of aspirants in the NPP, Mr. Botwe said the high number was not a problem but rather confirms how truly democratic the NPP was saying, "it will discourage losers in the primaries from forming their own parties since they can not get the numbers that would encourage them to do so".He expressed disappointment about the low patronage of people for the Ghana@50 celebration and how everything was centred only in Accra instead of decentralizing it for people to feel it.He said, "I have travelled all the way from Sunyani in the Brong Ahafo Region to Lambusia in the Upper West Region, Binduri in the Upper East Region, Walewale and Tamale in the Northern Region and no National Flag is flying or hoisted anywhere.